Fear of Riding — Colin Dangaard, Inc. 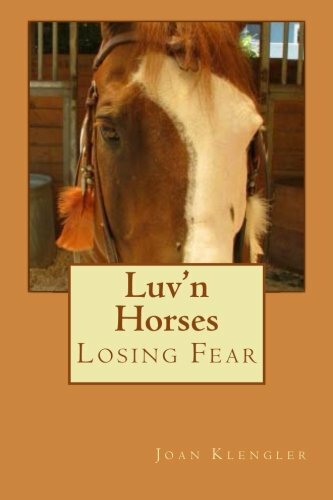 In her book “LUV’N HORSES, Losing Fear”, Joan Klengler articulates how a person can indulge in the joy of riding, while avoiding the paralyzing fear some associate with this activity. She has shown a way to achieve this that is both intelligent and practical. I have no doubt it works. And many people who read this enlightening book will be forever grateful. For me, however, my biggest fear is that it WILL work. I guess it is the way I was raised, in the Australian Outback, where horses are missiles to which you attached yourself, while chasing feral cattle on some of the most rugged land on the planet. You dare not train the “brumbies.” You want no discussions about lead changes while galloping through thick timber and going up, down and over everything between his ears. You ride holding the simple belief that you will not be killed. The good news is that you have about as much influence on the horse as a decal has on a rocket. Good because he is a horse and you are not. He knows what he can do, you do not. You just stay out of his face and keep your head down and your knees pulled in from ironbark trees. Doing this in my formative years put me in touch with fear – real fear. More important, it put me in touch with my horse. I felt his every movement, I visualized where he was headed, and he galloped me into that place. We became as one, because our lives depended on it. I read him, and he read me. We were, in reality, bonded by fear. In those days I would meetmen who were older, and they did not ride like this. They mended fences, they were the camp cook, they drove the truck. The other stockmen would simply note of these souls that they had “lost heart.” And nothing more was ever said. In the end, they could no longer use the fear -- the fear used them. And the horse knew it and didn’t trust them anymore. The bond was broken. It happened often. And if I had stayed in the bush until I was the age of these camp cooks, I am sure I would have been peeling potatoes. But I moved on around the world, and rode many horses in many different cultures and disciplines. The difference between most of these horses and all of the brumbies is that they were trained, to varying degrees. The horses changed, but I didn’t. I am still not “trained.” I love to gallop flat out at midnight in the Santa Monica Mountains, especially in the rain. I love to cross country race and steeplechase. And there is a moment in all that when I am back in the bush, on a brumby, with one simple belief. That me and my horse will survive. It is a moment I live for and cherish; a moment that makes me feel ten feet tall, and causes me to fall on the neck of my amazing horse and give him a big hug. We did it! We made it! I most do this alone, because I find it difficult galloping downhill in the dark while looking back over my shoulder. I guess some people can do it, but I do not have that ability. I must concentrate fully and completely on my horse, let my heart beat with his heart. Do I feel fear? Of course not! What I feel is sheer terror! If the “run” is a good one. But it does not paralyze me, rather it is right there, in my hands, on the reins, there on my leg with the horse, for me to enjoy – REALLY enjoy. We ride as one. There are moments when I am on a horse, feeling all this, that I actually forget to breathe, or so it seems. I find myself gasping. But this, ultimately, is why I ride and lovehorses. They take my breath away – and then give it back. Author Joan Klengler and her husband. Joan worked so hard to overcome her fear of riding she wrote a book about it.